Much of my public programming projects live here. Sounds are neat. A collection of sounds I've encountered. Payload and telemetry software and electronics for Uni's Sounding Rocket Club. Programming team lead for autonomous vehicle course. From an open ended networking course project during the spring semester of 2017, I wrote a paper describing (in part) a multi-user communication protocol for dealing with the long delays and for providing a high-level interface for multi-team scientific control and data transfer. With the help of one of my professors, Dr.Kanwal Gagneja, it has been published in the Proceedings of MobiSecServ 2018 – a part of IEEE Xplore Digital Library. It was a small conference (no more than 25 people). On February 25 I presented the paper in Miami, FL. Read the final draft here. I’m very happy to have it published and contribute a small amount to the conversation of how near-future people will be using extraterrestrial computer networks. There are some things I’d probably adjust a year later, though I am proud of the work, had a fun time writing it, and have tremendous gratitude toward Dr.Gagnegja for making this happen. This paper presents a high-level networking design to provide high bandwidth for a young and growing Mars settlement and science station. A physical network topology is described consisting of a high power ground station to communicate with orbiters. Different parts and devices of the station are connected with network infrastructure. Some examples are given for various non-obvious use cases of the network. Additionally, an upper level networking protocol is described to handle reliable communication between planets. This Transplanetary Data Mailing Protocol (TDMP) operates three processes working together: a database of retrievable files and user inbox files; a ‘parcel’ structure for data to be contained; and parcel piece fragmenting for asynchronous pipelined transmission and loss handling. Together, these systems allow ease of connection between people, scientists, and experiments. I was part of the inaugural Autonomous Vehicle class started by Dr.Dean Bushey at FL Polytechnic based off MIT’s down-scale R.A.C.E.C.A.R. It was an essentially independent study where three teams of students would work though milestone labs. I was the head programmer of my team. A few of us students also gave talks and demos to outside groups. I gave a 30 minute introduction to autonomous vehicle workshop at PolyHacks 2017. This one of the most fun and exciting courses/projects I’ve been a part of. The cars have a TX1 computer running ROS along with a variety of sensors. 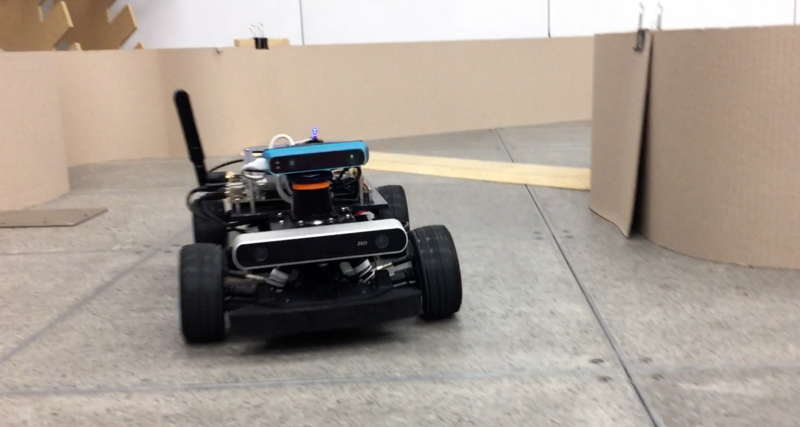 After building the car on a stripped down RC chassis, we started with basic lane/wall following using the LiDAR – “stay middle” as I called it. We then continued to visual servoing and shape detection with the ZED color stereo camera, mapping, localization, and finally path finding. The course concluded with a final ‘engineering brief’ and demonstration from each team. All code written and used at various points is in this git repo. It also includes a course log that I started putting together due to limited practical documentation of getting started with each of the milestones. I recorded many videos of our progress though the semester and edited them into a single video (below). I also cut that down further into an additional one minute summary video. My team’s car is the one with blue camera ‘nose’. I’ve had this idea for a while and the introduction of new apis (such as voice recognition) in iOS 10 I went ahead and made this app: Quick Voice Memo. After more time than necessary, I created this app: Note Drop. Available now on iOS and coming soon to Android. Read more. I made an app for the Apple TV with the new SDK for tvOS. Read more about the app. Available now on the Apple TV. I had a thought, I looked it up, and it did not exist (as a tld), until now. I am the proud owner of PicturesOfPeopleTaking.Pictures. It is exactly that. Pictures, of people, taking pictures. It is also open for public submissions. It uses Django as a backend and built on a Bootstrap front-end. I was recently recorded whilst playing through a piano session. I also recored a better sounding track as a gift for relatives. Sounds range from Bohemian Rhapsody to the Office Theme to some improvisation. Get it Here! Quartz Run! The advent of the SpriteKit Framework from Apple/iOS 7 brought me to my first experience with game engines. This is one of my bigger projects and also took a while to get approved. Version 1.0.0 may have a few bugs, especially on the iPad. Feedback on these are appreciated. More features will come with time. A brief video made for an english course. First real education attempt, CGPGrey style presentation.